I’m challenging myself to come up with a pun for every title of this blog; any and all ideas are welcomed. You can e-mail them to me at mcooley@pugetsound.edu. You think I’m kidding, but I’m not. 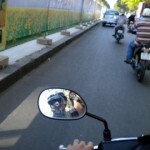 On Tuesday, I tackled one of my largest challenges—riding a motorbike through the streets of Ho Chi Minh. Even just crossing the streets in this city is maddening. I am told that I should walk confidently and calmly, making eye contact with the dozens of drivers flying across on motorbikes as they weave through each other and I’ll be fine. What I WANT to do is cover my eyes and ears, scream like the small girl I am, and run across the street. So when I walked into the lobby of our guest-house on Tuesday morning to find 12 helmets and transportation waivers, I couldn’t believe that I was supposed to actually ride on one of these sly beasts. 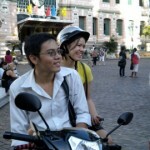 Vi and Phat had coordinated 10 other students from the English Club, mostly students from the Ho Chi Minh school of Economics, to take us around the city. It was amazing how this army of intelligent and kind Vietnamese students looked menacing, but they did… My driver was a man named Huan, and moments after I hastily got on board, we were off. And I loved it!! This is definitely the way to see the city. The traffic is like this single entity, moving together. There are unspoken rules and motorbikes and taxis and busses move almost seamlessly. It was still a jarring experience, but an exhilarating once which left me feeling all the better and more confident about this city I may call home for a large part of my trip here. I only hope that I don’t pick up any driving or pedestrian habits here that would land me in jail or dead in the states. I’ll need some help from you all as chaperones when I get back.